Pergolas are a great additional feature to the exterior of your home. Pergolas are a welcome addition for a walkway, passage way, as well as sitting areas. 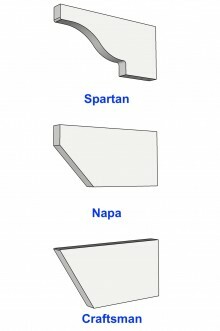 We offer fiberglass and PVC, rather than your traditional style brick, stone, or wood for our modern Pergolas. During the life of the Pergola, the durability and weather resistance of the fiberglass is virtually maintenance free. Comparing to the traditional materials used, the fiberglass components offer an appearance that last for many years ahead. They do not twist, wrap, after installation and will maintain their full strength. Structural fiberglass pergola kits use fiberglass components that are strong, lightweight, and provide a higher level of aesthetic quality than vinyl or wood pergolas. Our Pergola Kits come in several options; white with Spartan Tails, and square or non-tapered round Pultruded fiberglass columns without neck moulding. Optional wind-load/deck plates are available. Elite Trimworks distributes HB&G Cellular PVC Pergolas PermaCast® columns thought-out North America and the Caribbean. PVC Premium Pergolas System are maintenance free and are built to last a life time. They even come with a limited life time warranty (Warranties.pdf) Our customer service representatives are ready to help you create a custom trellis, custom arbor, or custom pergola that will add a great presentation and value to your home.